As we move towards the E.U.’s Medical Device Regulations (EU 2017/745) and In Vitro Diagnostic Regulation (EU 2017/746) — MDR and IVDR, respectively — the technical committees are in the process of determining necessary changes to the European Harmonized standards, including the incorporation of the new Annex ZA/ZZ. The harmonized standards need to be reviewed and revised to reflect requirement changes under the MDR and IVDR. Although technical committees can start drafting changes, the European Commission must issue official standardization requests, which hasn’t occurred yet. The European Commission defines the items needing standardization, and must review each revised standard against the General Safety & Performance Requirements before it can officially recognize a standard. To accomplish this, the European Commission considered splitting the Standardization Requests and consulted with all relevant technical committees to include key standards, but then realized that splitting the standards would result in a very slow process. While this process will probably take the European Commission a long time to complete, technical committees already have started to revise relevant standards. By collaborating closely with the European Committee for Standardization (CEN) and the European Committee for Electrotechnical Standardization (CENELEC), the European Commission expects to expedite the publication of harmonized standards and to avoid problems, but this task has not been easy. While some standards might simply need changes to their Annex Zs — the links between the standard and the relevant essential or general safety and performance requirements — others need changes in technical content, which will probably end up being a lengthy process for many harmonized standards. Given the uncertainty whether the harmonized standards will comply with MDR/IVDR, it is unclear if Notified Bodies will accept previous standards to demonstrate compliance to the new regulation. This might be accomplished by showing compliance with the old standard, highlighting its differences from the new regulation, and then demonstrating actions taken to comply with the new requirements. Technical Committees need to launch the standard revisions and obtain consensus after multiple consultations by participating countries. Each individual Technical Committee must prioritize its workload and determine feasibility. The standards will then need to be reviewed and published in the Official Journal of the European Union, by the European Commission, before they can be considered official. Therefore, many standards might not be ready in time for medical device manufacturers to demonstrate compliance with the new regulations. A draft list with around 230 standards to be harmonized for MDR, and 50 standards to be harmonized for IVDR, has been provided to the CEN/CENELEC. Technical Committees estimate it will take between two and three years to complete all their harmonization assignments, but it is uncertain whether they will be completed prior to the MDR enforcement deadlines. The European Commission selected Ernst and Young to manage consultants supporting the harmonization efforts tasks. It is expected that the Technical Committees will begin work on the revisions and ask for feedback from the team of consultants at Ernst and Young before requesting consultation with other countries as part of the revision process. There seems to be a consensus among industry experts that the E.U. commission could have dedicated available resources to deal with this incredibly huge task, especially considering that the Commission still needs to address a backlog of standards that have been revised, but are not harmonized under the medical device directives and/or have not yet been published in the Official Journal of the European Union. This is problematic, since Notified Bodies require medical device manufacturers to use up-to-date standards to demonstrate conformance. However, both Notified Bodies and manufacturers need to embrace the fact that the European Commission still needs to issue formal requests for standards to be harmonized under the new regulation (mandate), to be worked by the Technical Committees, and then approved by the Ernst and Young Technical Consultants before they can be published. The commission has started prioritizing vertical standards (product safety standards indicating necessary safety aspects of specific products and/or processes — making reference, as far as possible, to basic safety standards and group safety standards), as well as horizontal standards (basic safety standards indicating fundamental concepts, principles, and requirements with regard to general safety aspects applicable to all kinds of products and processes). The plan is to have a combination of both types of standards prioritized by the commission through several standardization requests. If they have not already, medical device manufacturers should begin discussions with their Notified Bodies to confirm impacts, and to develop up-to-date regulatory navigation approaches. The concept of Common Specifications has been introduced in the new MDR and IVDR. They are defined as a set of technical and/or clinical requirements — other than a standard — that provide a means of complying with the legal obligations applicable to a device, process, or system when no harmonized standards exist, when relevant harmonized standards are not sufficient, or when there is a need to address public health concerns. Devices that conform to a Common Specification are presumed to conform with the regulatory requirements covered by that common specification — similar to the approach with harmonized standards. But, the MDR and IVDR state that compliance with Common Specifications is mandatory, unless the manufacturers can justify an equivalent level of safety and performance through other methods. The Commission intends to adopt these common specifications to assess clinical evaluation and risk management associated with the safety of devices absent a medical purpose (for example, contact lenses without a corrective function). Common specifications also will be used to establish requirements for validation, risk management, testing, and reporting of incidents associated with reprocessing single-use devices within health institutes. Preparing a new common specification requires that the Commission initially seeks advice from the newly established Medical Device Coordinating Group (MDCG), which comprises experts nominated by the E.U. member states. It is expected that this committee will consult with relevant stakeholders and take into account European and International Standards. Official release of a common specification will require approval by the newly established Medical Device Committee, which is made up of representatives from E.U. member states. The Risk Management Standard ISO 14971:2007 currently is undergoing a minor revision and is on track for publication in mid-2019. ISO 14971 is the only standard known to have been accepted with a 100-percent affirmative vote for both the 2000 and the 2007 editions, by both ISO and IEC member committees, and it is expected this will be the case with the new revision. The Draft International Standard (DIS) is intended to leave the fundamental risk management process unchanged, and it has been out for comment by the National Standards Body (NSB) since July 19, 2018. The ISO/IEC Technical Committee 210 is scheduled to meet and review the comments in Seoul the week of Nov. 12, 2018. At the meeting, it will be decided which comments need to be addressed in the standard’s final revision, and the committee will prepare the Final Draft International Standard (FDIS). Definitions in this most recent version have been updated, and some requirements are clarified, such as: overall risk, risk management reporting, and the management of both production and post-production information. It is expected that the revised international standard will be adopted as a European Standard and, therefore, Annex Zs covering the E.U. Medical Device Directives (MDDs), as well as the new MDR and IVDR, will be included. The standard clarifies its use for managing all risks associated with medical devices, including biocompatibility, infection, data, security, electricity, moving parts, and usability. The current draft emphasizes the importance of benefits expected from use of a medical device, and several informative annexes have been moved to a new guidance titled ISO/TR 24971, whose publication is expected in parallel with the new standard. This guide will have the same format as 14971 to make it easier to follow. Since there has been a lot of industry discussion about risk-benefit analysis, the new standard will define the term “benefit” — which has not been defined in previous versions — but the risk-benefit analysis requirements are not expected to change. The new edition of ISO 14971 will continue to be an international standard, and will not address national and regional issues; these will be left up to the national and regional standards bodies. While EN ISO 14971:2012 is harmonized to the MDD, it is not harmonized to the MDR. A new CEN document will have to be created to address these differences, which probably won’t happen until the new ISO 14971:20XX is released. It is important to note that there is no official CEN participation in crafting this new version, though a number of European countries are represented in the working group. The changes are aimed at improving clarity in risk management implementation requirements, so it is not expected that organizations will have to revise processes to align with the new standard. But, while changes to the standard will not be significant, there will be some work associated with updating references to the previous standard in existing quality system documentation. 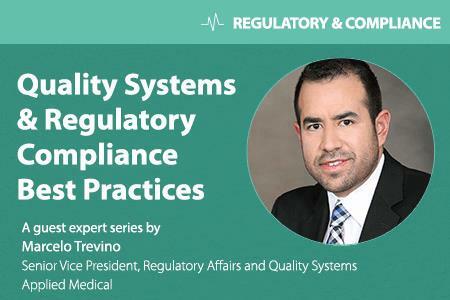 Marcelo Trevino is a Senior Vice President of Regulatory Affairs & Quality at Applied Medical, a provider of technologies for Minimally Invasive and General Surgery, as well as Cardiac, Vascular, Urologic, Colorectal, Bariatric, Obstetric, and Gynecologic specialties. Marcelo has over 20 years of experience in Quality and Regulatory Affairs in multiple leadership roles. He has an extensive knowledge of medical device management systems (ISO 13485, ISO 14971), domestic medical device regulations: USA (FDA) and international medical device regulations: Australia (TGA), Brazil (ANVISA), Canada (Health Canada), Europe (Ministry of Health), and Japan (MHLW / PMDA). Mr. Trevino holds a B.S. in Industrial and Systems Engineering and an MBA in Supply Chain Management from the W.P. Carey School of Business at Arizona State University. He completed Specialized Studies in Regulatory Affairs Management at University of California, Irvine and is a certified Biomedical Auditor through the American Society for Quality (ASQ-CBA), a certified Quality Management Systems Lead Auditor by Exemplar Global, and has consulted with several corporate executives in medical device firms to implement different process and quality improvement projects. Mr. Trevino has experience working on Lean Six Sigma Projects and many Quality/Regulatory Affairs initiatives in the U.S. and around the world, regularly publishing articles to assist corporations in their quest for exceptional quality systems/regulatory compliance, and conducting Supplier and Third Party Audits as a Certified Lead Assessor.